Please join us for a preview of some footage from ManDove at the Experimental Media and Performing Arts Center (EMPAC) at RPI, April 13th at 6:30pm. 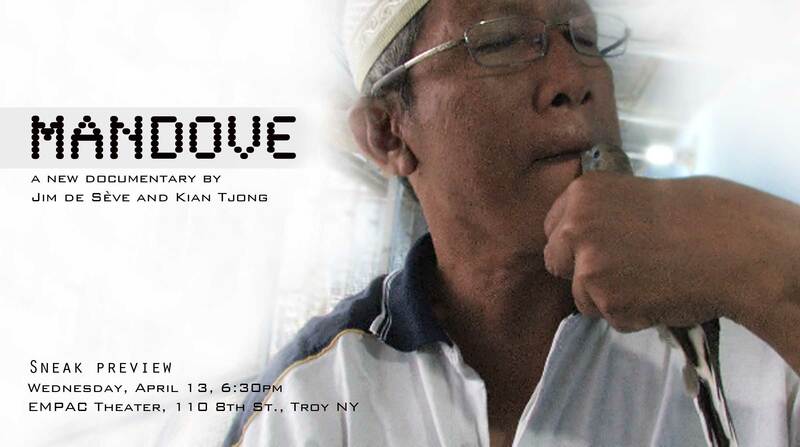 ManDove will take you into an ancient and mysterious brotherhood of singing dove competitors in Java, Indonesia. Ancient Javanese wisdom prescribes five things a Javanese man should pursue for a complete life: garwo (wife), curigo (Javanese keris dagger, weapon),wismo (house, residence), turonggo (horse, transportation) and kukilo (bird, hobby). The last requirement can only be fulfilled by owning perkutut. Leagues of Javanese men hoist zebra doves 23 feet high for competition. ManDove gives cinematic space for the audience to consider Islam, gender and the circularity of the modern camera.